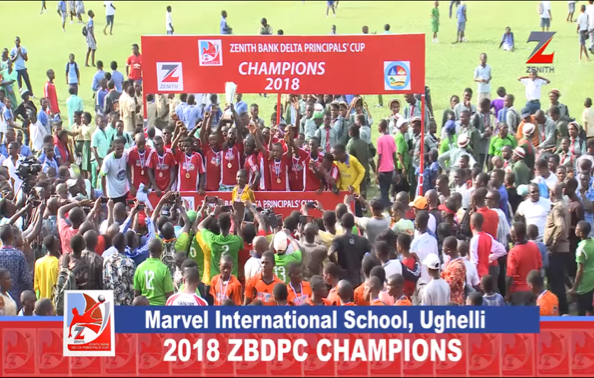 The third edition of the Delta State Principals’ Cup being organized for all secondary schools in the State and sponsored by Zenith Bank Plc starts next week. According to the organizers, the preliminaries of the revived annual ‘catch-them-young’ initiative will kick-off on October 31, 2018. The competition which was grounded for many years is back courtesy of sponsorship by Zenith Bank Plc and over 1,200 private secondary schools and 446 public government secondary schools in the state are competing in this edition. On November 1, 2018, the preliminaries will start in all 25 Local Governments of Delta State and registered schools would compete to emerge the group stage representative from their Local Government Areas. Commissioner for Basic and Secondary Education in Delta State, Mr. Chiedu Ebie, is expected to play a supervisory role to ensure the smooth running of the competition, which is very dear to the heart of Governor Ifeanyi Okowa. Group Managing Director of Zenith Bank Plc, Mr. Peter Amangbo, has assured that this year’s competition would be an improvement on the last edition. Amangbo also stated that Zenith Bank was always elated to contribute to the development of Nigerians youths by supporting various endeavors across the country. “This is a youth football competition, but our impact goes beyond just football. We are also involved in other sports in a bid to continually identify talents for the country, while also engaging Nigerian youths positively in their various areas of competence”. “We are going to make this edition better because improvements must be recorded as we move on. So far, we are proud of this partnership with the Delta State Government and we expect all the participants to enjoy themselves.” Amangbo said.